Modern dentistry is now approaching a new horizon in the repair process and allows dentists who perform cosmetic dentistry to create tooth coloured restorations which appear more natural than ever. The new advanced technology and the new techniques are not only reliable and safe, but also the results give the tooth full function with a natural appearance. Tooth coloured direct restorations involve composite resins, which are materials that are free of metal amalgams that contain mercury, silver and lead. While these amalgams are completely safe and biocompatible with the body, they do not offer the same esthetics as tooth-coloured restorations, which come in multiple shades to match the surface of any tooth. Earlier, restorative dentistry relied on less natural-looking metal amalgam fillings which frequently required preparations that involved removal of additional tooth structure in order to create a form for retention (so the amalgam fillings would not fall out). While they have proven to be perfectly reliable restorations for decades, with advances in dental technology, newer resin-based filling materials have been shown to be as durable and strong as amalgam fillings while also providing a much more natural appearance to any tooth that receives a tooth-coloured filling. Furthermore, in many cases, due to the way that a tooth-coloured restoration is bonded to a tooth, it allows for a more conservative preparation to be made, saving valuable tooth structure in the process, which is a factor in maintaining the longevity of any restored tooth. Cosmetic standards can produce results which can withstand the normal pressure of biting or chewing like natural teeth while recreating the form and appearance of a given tooth in the way that it should appear in the mouth. The treatment is done by isolating that particular tooth, and removing damaged tooth structure – and in most cases, older filling material as well – under local anesthesia. The composite resin material is then placed over the prepared portion of the tooth in layers, in order to make sure each layer can be properly cured, which improves bonding to the tooth as well as to each previous layer or placed resin material. Tooth coloured restorations have advantages: one such advantage is that, in many cases, more tooth structure can be preserved while repairing an area of decay or fracture on a given tooth, while another is improved aesthetic appearances when compared with metal amalgam fillings. The fillings, or restorations, look really nice when you smile. The restoration blends in with your natural tooth enamel when it is used to fill a cavity or fix fractures or defects, and can be polished to a high shine to more closely match your natural tooth structure. In this way, you can be sure that your teeth are free from decay, fully protected from the wear and tear experienced in the mouth on a daily basis, and will also give you a beautiful smile in the process. 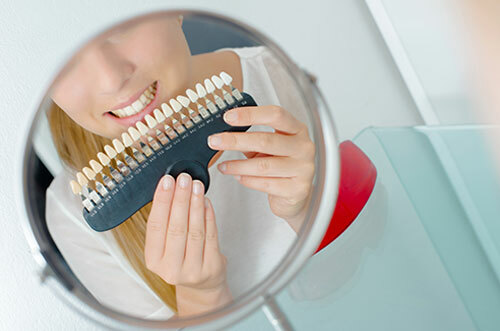 If you are interested in how tooth-coloured restorations can improve your smile, schedule a consult at Albion Dental Office by calling (416) 749-9732, and Dr. Trotti will be happy to answer any questions you may have.